Today at our university the International Scientific and Practical Conference “Psychological Aspects of Character Development in Children” has begun its work. It involves academics, lecturers, students from Ukraine, Poland and the USA. The event was organized by Ivano-Frankivsk College of the Precarpathian National University in cooperation with the International Institute of Character (Dallas, Texas, USA). Participants of the conference were greeted by Yuriy Moskalenko, a principal of Ivano-Frankivsk College of the Precarpathian University and Charles Landreth, a teacher of trainings and seminars, an executive director of the international program “Character International, Inc.” (Dallas, Texas, USA). “For five consecutive years we have been working with our American colleagues within the framework of the international programme “Character Development in Children”. During this period, about half a thousand students passed thematic trainings, seminars, classes. Also, the participants of the program were college and university teachers, school teachers of Ivano-Frankivsk. We aim to continue working in this program and to involve more not only future educators but also those who work in schools today “, said Yuriy Moskalenko, a principal of the Ivano-Frankivsk college. The conference is to last for 2 days. It is the result of a five-year partnership between Ivano-Frankivsk College of the Precarpathian National University and the International Institute of Character (Dallas, Texas, USA) within the “Character Development in Children”program. 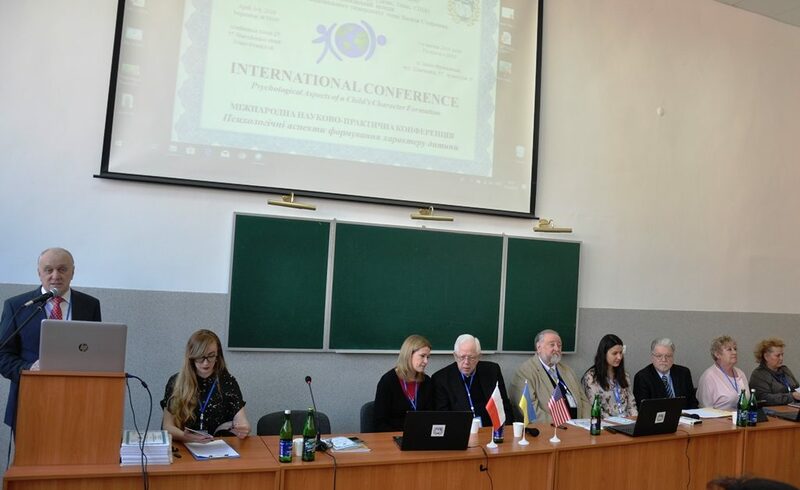 Charles Landreth, an executive director of the international program “Character International, Inc.”, in his welcoming remarks noted the fruitful cooperation with Ivano-Frankivsk College of the Precarpathian University. “We are glad that we have an opportunity to teach your future educators, teachers. This is a very important program. Our task is to educate children, their moral qualities, their character. We must start developing character in children as early as possible. Therefore, we focus primarily on the child’s preschool age. It is important to prepare and teach educators how to raise children especially at that age, ” Charles Landreth emphasized. Within the framework of the conference program there is a plenary session and panel discussions on the following topics: “Psychological and pedagogical aspects of character development in preschoolers”, “Peculiarities of character development in children of the junior school age”. During the plenary session, in particular, John D. Cooke, a professor of psychological sciences, a member of the American Association of Psychotherapists, spoke; Renata Klechanska, a moderator of the ORPEG program of the Center for Polish Education Abroad; David Glison, a master of psychology, a certified character trainer; Iryna Sidanych, a professor of pedagogical sciences, a professor of the department of pedagogy, management and administration of the Educational-Scientific Institute of Management and Psychology of the UME NAES of Ukraine; Hanna Maksymchuk, a candidate of pedagogical sciences, a vice principal of the Creative Laboratory for the study of character development in children of the Precarpathian National University, a teacher of the Ivano-Frankivsk college. Also, during the conference students and teachers of the Ivano-Frankivsk college and other structural subdivisions of the university received certificates of a coach of the “Character Development in Children” program. In general, such a paper was handed over to more than 150 participants of the program.